Given the robust tiny-house movement (to wit: a handful of TV shows, DIY workshops, tiny-house kits, an annual conference and countless books and blogs), it’s surprising that so few of them exist legally. Although cities don’t spend much time hunting down tiny-house dwellers, the structures violate building code in most jurisdictions, because they don’t meet the square footage requirement for permanent residences. Hence the house-on-wheels regulatory loophole: If folks complain about your house, simply tow it to another spot. Plenty of people offer tiny houses as vacation rentals, but leave it to progressive Portland to introduce the first tiny-house hotel. 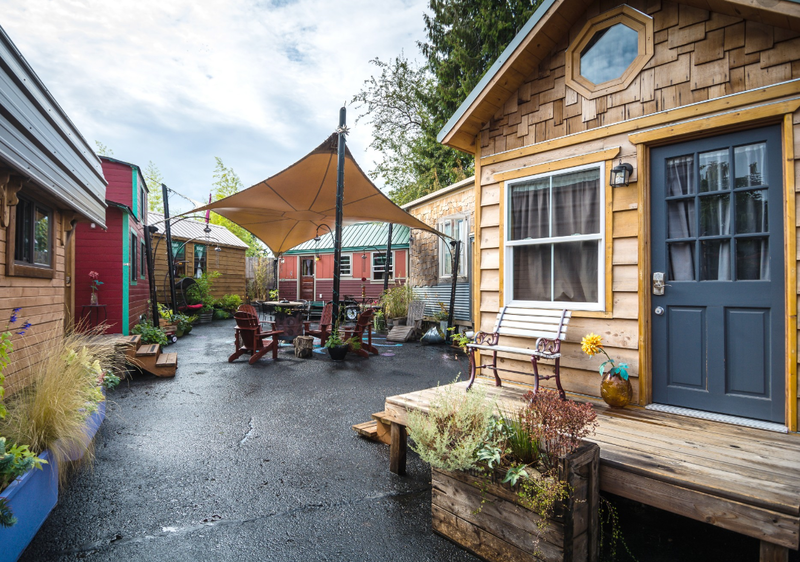 The Oregon city has not only legalized accessory dwelling units, also called ADUs (small living quarters on the same lot as a larger home), the city embraces and incentivizes smaller-scale living. This approach helped make it possible for Deb Delman and Kol Peterson to open Caravan, which they say is the first legal commercial application of tiny houses in the United States. The houses are hooked up to the electric grid and the city water and sewer systems (sorry, compost-toilet devotees). This entry was posted in Uncategorized and tagged tiny house, tiny house hotel. Bookmark the permalink.